Over the years skin spots can show up on our skin making us look older, even ten years older, and that my friends is not funny at all. The question here is if there is any way we can deal with this on due time without spending an onerous sum of money, and the answer is YES. Now before putting our hands on this Japanese method to deal with skin spots lets see how to prevent and why they appear. One of the main reasons skin spots will show up is overexposure to the sun so we need to avoid to do such thing and if we need to expose our skin to the sun is important to use a sunscreen at least 30 minutes before going outside. 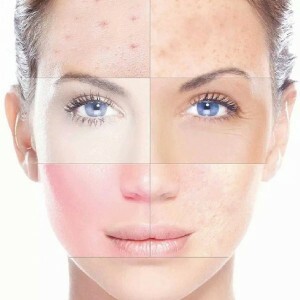 Be careful with the medication you are taking or the skin care products you are applying to your skin because they can also be responsible of those skin spots. Make sure your diet contains enough vitamins A, B and E but not too much which is bad too, calcium is either important. Now this ancient Japanese trick will help you with those skin spots vanishing them little by little. You will need rice, 3 spoons; honey, 1 spoon and milk, 1 spoon. Boil the rice in two glasses of water and then after strain the water since you will need to use it later. How to prepare the ingredients? It´s simple just mix the rice, the milk and the honey until you get ­­­­­­­­­some sort of gelatinous substance, apply it to your face and leave it there for 15 minutes, then wash it with the rice water you saved, wait another 15 minutes and wash with abundant fresh water until you have removed any rests of the rice water, dry with a soft towel. Why are these ingredients good for your skin? Rice water contains anti-oxidants, honey is waxy and will help to remove dead cells, this aside the fact it contains antimicrobial agents; at last but not least is milk, which will add vitamins A, B and D aside calcium all important nutrients to restore your skin. You can use this mixture once a month as well as you can have some Sushi the very same day.